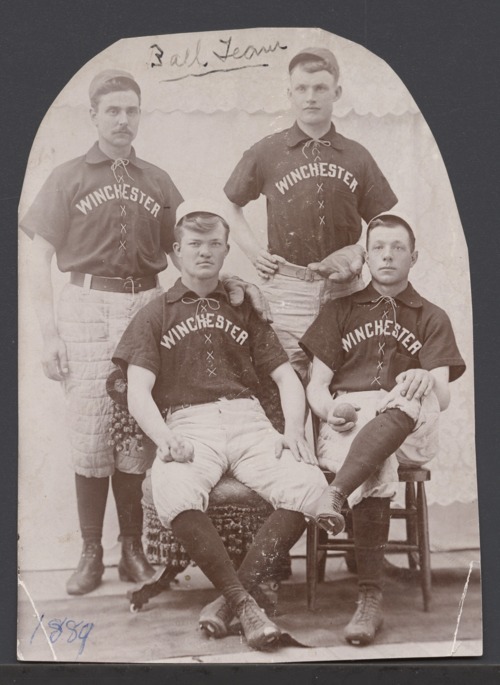 This is a studio portrait showing four members of the Winchester baseball team, including Luther "Dummy" Taylor. Taylor is seated on the left; the other three players are unidentified. Taylor is known to have played with the Winchester team during at least portions of the 1895-97 seasons. Luther Taylor was a major league pitcher from 1900 through 1908. All but four of his 274 major league pitching appearances were with the New York Giants. He compiled a 116-106 win-loss record as a major leaguer, with an ERA of 2.75. Upon leaving the Giants, Taylor played for several years in the minor leagues. Taylor, who was deaf, was born in Oskaloosa in 1875 and attended the Kansas School for the Deaf in his youth, graduating in 1895. Following the end of his professional baseball career in 1915, he became a coach and instructor at the Kansas School for the Deaf, where he remained until 1923. He then accepted similar posts working first for the Iowa School for the Deaf, and then the Illinois School for the Deaf. Luther Taylor is in the Kansas Baseball Hall of Fame and the Kansas Sports Hall of Fame. He died in 1958, and is buried in Baldwin City.